UPDATE (7 P.M.): The National Weather Service has raised the high wind warning to sustained gusts possible up to 80 miles per hour. Power outages in the region have hit 9,000 with Henry and Bedford Counties the hardest hit. The wind gauge in our back yard shows gusts up to 52 miles per hour and the weather station on my computer calculates the temperature with wind chill at seven degrees below zero. Limbs now litter the white landscape of snow. 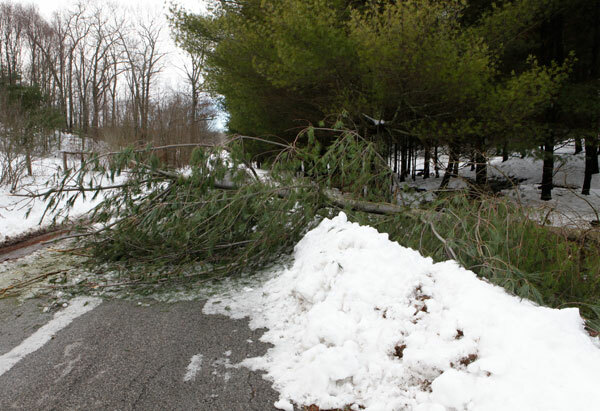 Fallen trees block some roads. Power blinks on and off, although not long enough for the generator to kick in — yet. The National Weather Service says we’re under a “high wind warning” through Friday. Schools remain closed in Floyd County and most other areas of Southwestern Virginia. Snow remains ice-crusted. Black ice awaits unsuspecting drivers. UPDATE (6:00 p.m.) Appalachian Electric Power reports 7,212 customers without power in counties surrounding Floyd County with Henry County the hardest hit, followed by Carroll. No outages reported yet in Floyd County. Drifting snow is creating havoc on many roads. Poor Farm Road was blocked for a while and drivers negotiated deepening drifts on other secondary roads. Wild weather makes one feel “vital”…no? There’s no reason to be afraid if you are prepared.